Shiro (white) is an important symbolic colour in Japanese culture. This colour is symbolic for i.a. purity and sanctity, but also for mourning and death. The Samurai wore white underneath their armour, this symbolized their preparedness to die in battle. 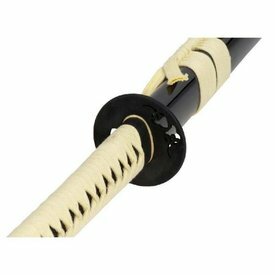 This katana has a length of 101,5 cm with a blade of 72 cm and a grip (tsuka) of 29 cm. It weighs 1050 g. The blade is made in the Shinogi-Zukuri style, hand-forged from 1045 carbon steel. 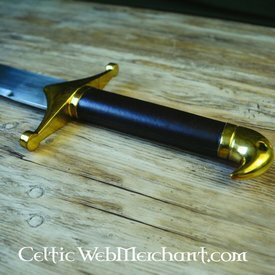 The blade has a sharp edge with a decorative line (hamon) for a special appearance. The grip wrapping is made of white cotton in the classical Hineri-Maki style, underlaid with genuine shagreen. The scabbard is white high polish lacquered and made of wood. The katana has a long tang (nakago) which is fixated in the grip with two bamboo pins (mekugi). The sword is delivered including a John Lee protective cover.